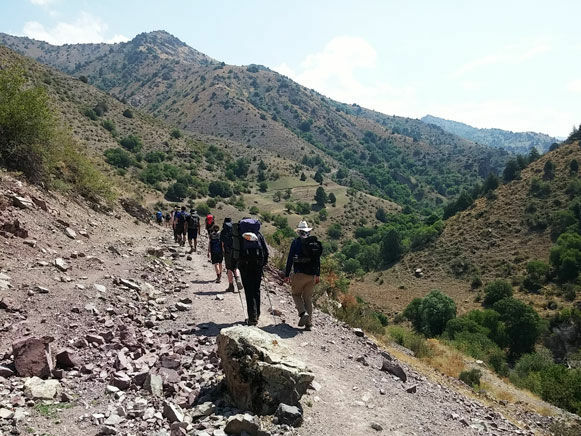 Explore one of the most scenic mountain areas of Uzbekistan with this 3 days trekking tour in Chimgan area of Western Tien Shan Mountains. 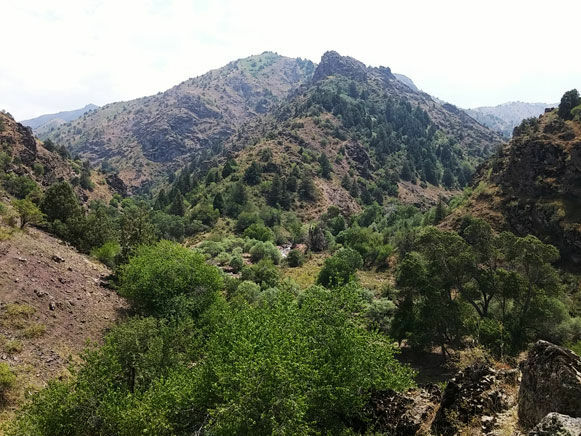 Rich flora and fauna, picturesque mountain landscapes and availability of different hiking options make this area popular trekking destinations among the guests visiting Uzbekistan. 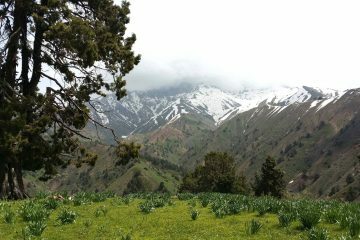 The first day of trekking start with the hike from Beldersay Ski Resort near Chimgan village, crossing in total 36k m distance (4-8 hours trekking per day) in three days, the tour is completed near the village of Shuldak in Aksakata valley. The itinerary is suitable for all participants who are in good and healthy shape. 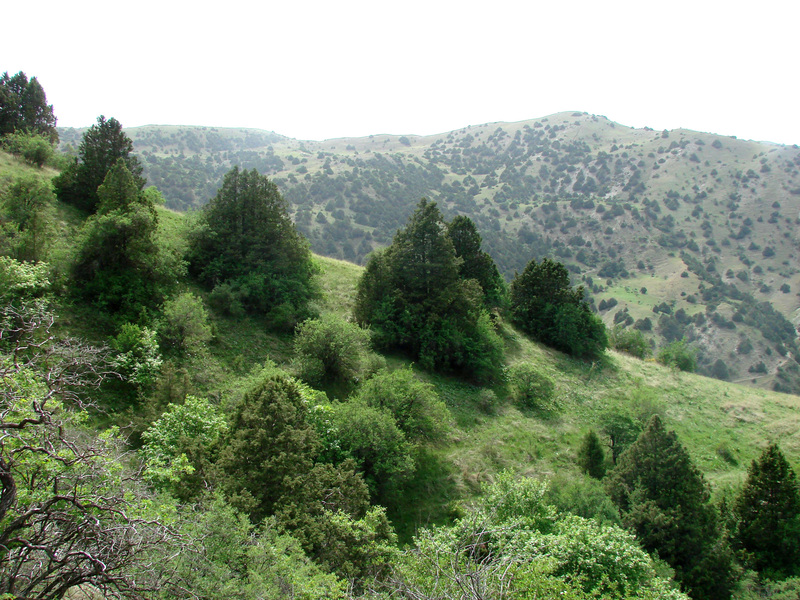 Transfer by car from Tashkent to Beldersay Resort (98km / 1,5 – 2 hours). 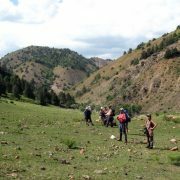 Start trekking near Beldersay Ski Resort towards plains called Sunny Meadow, reaching the meadow descend to Marble River. After an excursion through the valley of Marble River, continue heading up towards Urta Kumbel pass (1850). Descend from Urta Kumbel to Beldersay valley. Start ascending from Beldersay valley via Chetkumbel pass (1800m) towards Kubmel pass (2550). On the way see the petroglyph site at 2400m height above sea level (highest point in three days trekking). From petroglyph site descend towards southwest to Nurekata valley and reach the camping area (1400m). Continue descending in Nurekata valley until reaching the junction of Nurekata and Aksakata rivers. From the junction continue towards the village of Shuldak (1050m). 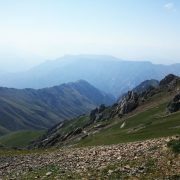 Meet by our driver in Shuldak and be transferred to Tashkent (84km/1,5 -2 hours). Items of personal nature such as sun block cream ect. In the morning transfer by car to the trek starting point – Beldersay Ski Resort (98km /1,5-2 hours). 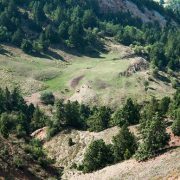 Start trekking near Beldersay Ski Resort towards the plains called Sunny Meadow. Reach the meadow and observe the stunning mountain landscape around, the place is also great for taking pictures of panoramic mountain views. 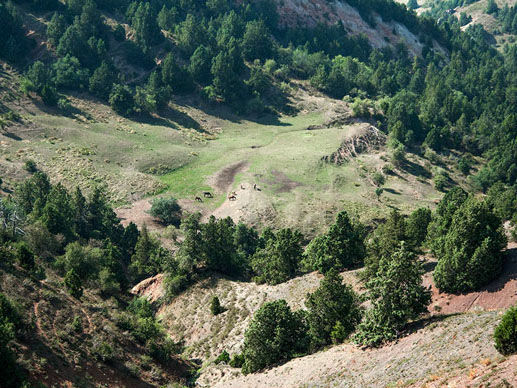 From Sunny Meadow you will then continue along the trail that descents to Marble River. Before ascending from Marble River valley to Urta Kumbel pass (1850), walk through the valley seeing on the way waterfall and canyon. Picnic in the valley. 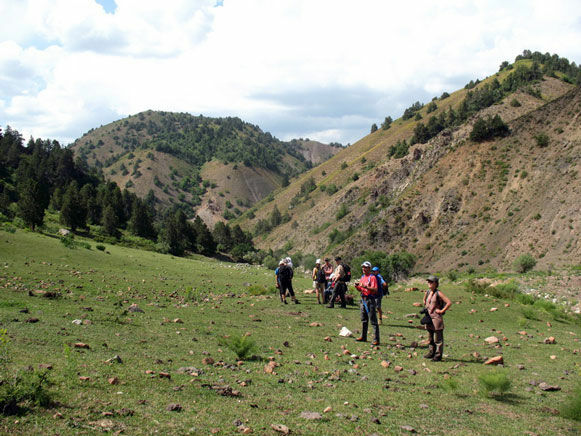 After lunch continue heading up along the trail surrounded by numerous juniper trees to Urta Kumbel pass. Observe the stunning views of Chirchik valley and Chetkumbel pass from Urta Kumbel. After a short rest on the pass, descend to Beldersay valley for our today’s camping area (1720m). After breakfast we pack our things and continue trekking up from Beldersay valley generally to the south towards Chetkumbell (1800) pass that separates Beldersay and Nurekata valleys. From Chetkumbel view the scenic panorama of massive Chimgan peak (3309m). Carry on along the trail on the ridge line to the east towards Kumbel Pass (2550m). 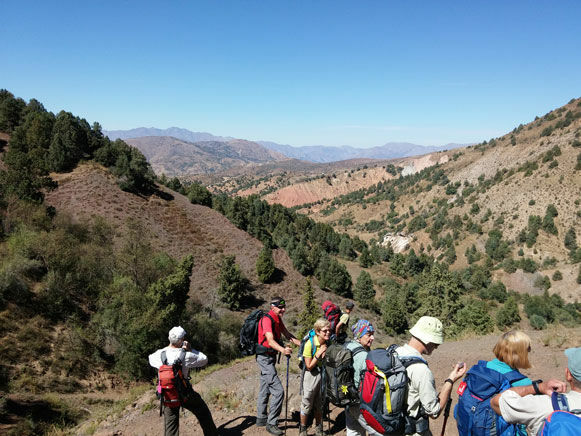 Before the major ascend on the way to the Kumbel pass the track turns sharp to the left and after short walk on the left hand side we will see petroglyph sites (2400m) from the late Stone Age period. This is the highest point of our three days trekking in the mountains of Ugam Chatkal National Park. The spot opens up panoramic views of Chatkal Range and Chirchik valley. From the petroglyph site we start descending to the south to scenic Nurekata valley. We will be camping in an open space along the river-bed of Nurekata (1400m). Today we continue descending along the valley of Nurekata river abundant with juniper, walnut and fruit trees until we reach the junction of Aksakata and Nurekata rivers. On the way we will see herds of sheep and horses in the mountain meadows. Occasionally one can see birds of prey flying high above the valley. 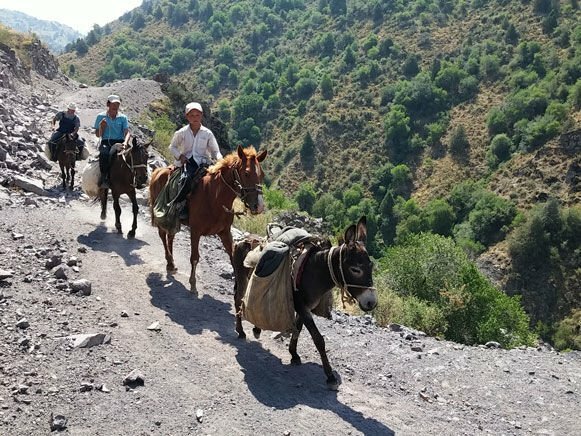 Walking down through the valley we meet summer huts of nomadic shepherds where one can try Kymiz (fermented mares milk – the traditional drink of mountain people). 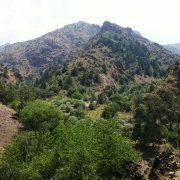 Most of the shepherd families build their summer huts in the valley and stay there during hot summer months. 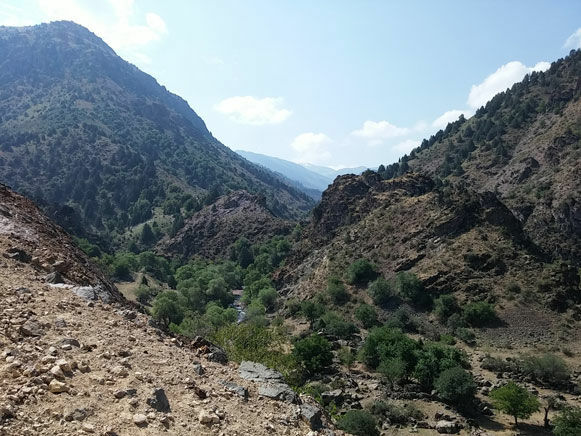 Once we reach the junction of two rivers we continue heading down for about 1 hour along the valley of Aksakata river crossing a small pass before reaching the ending point of our trek – Shuldak village (1000m). 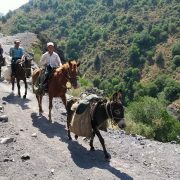 Arriving in Shuldak village we will be meet by our driver who transfers us to Tashkent (84km/1,5 -2 hours). 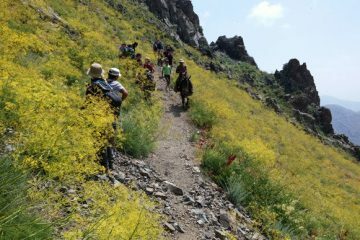 Your mountain guide is a leader of a group and a representative of our company on the program. 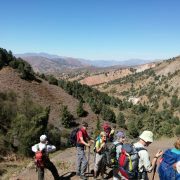 Therefore the guide reserves the right to change the route of the trekking in the program due to known safety issues and bad weather conditions. It is the responsibility of the guide to act as a cook for the groups smaller than 5 people. The service was excellent. During all the trip, including the trip in the car, Nourredine and the driver, were ensuring that we were sufficiently hydrated and not hungry. The walking distance was well balanced between the days. During the most difficult part, Nourredine was really paying attention for our rest time. The landscapes were nice and the camp site was perfectly placed. The food was good and with discoveries. 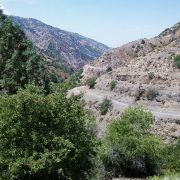 We booked two-day trips in Nuratau and Chimgan mountains by Responsible travel LLC. We were happy with everything Sherzod organized for us. We found the service and response to be excellent. Sherzod tailored the official published program according to our personal requirements. All pick ups and transfers were coordinated well and punctual. The guides and driver were friendly, spoke fluently English/Russian and provided helpful services and planning. We found both tours impressive. We have recommended our friends to get in touch with Responsible travel LLC, if they are going to visit Uzbekistan. 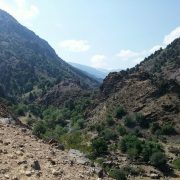 Thank you for the nice tour in the Chimgan Mountains. We had an excellent time. 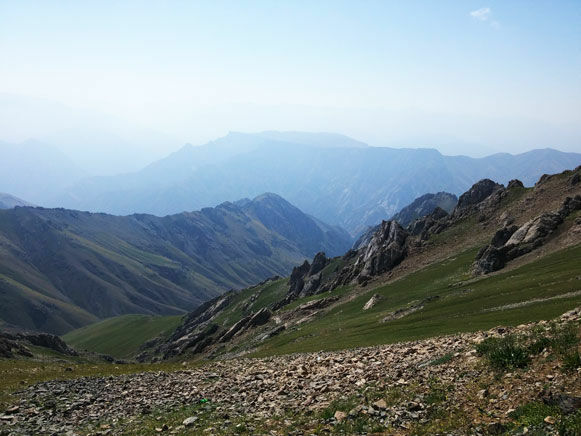 My boyfriend and I did the 3-day trekking in the Chimgan mountains, and we loved it. 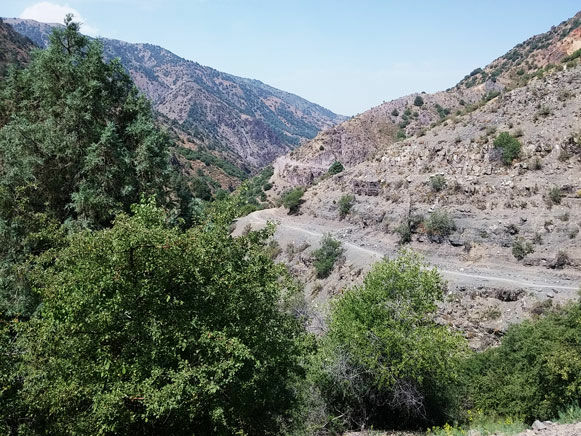 It is a beautiful trip and was definitely one of the highlights of our 3-weeks in Uzbekistan. The guide was very helpfull, and the food and service was great. Some parts were difficult but when we reached the top it was worth it! It was very cool to stay in the middle of nowhere, the stars at night are amazing! But bring warm clothes, as it can be pretty cold during the night! 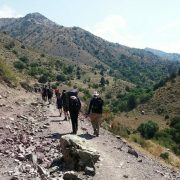 Thank you for the beautiful trip, we will definitely recommend a trekking in Uzbekistan with this organisation.